On November 27, 1971 Ed Francis presented four matches at the Civic Auditorium featuring two tag team titles on the line: the men's Hawaiian Tag Team Championship and the women's World's Tag Team Championship. 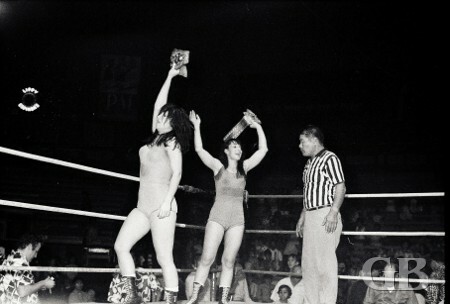 Three days prior to tonight, the women's title changed hands at the Honolulu International Center. Tonight's match is a rematch and since it happened so quickly, the newspaper ad could not be changed in time. In the ad (see right), the women's matches are listed a being single matches. In the first two matches, Duncan Mactavish took two out of three falls to beat Fidel Castillo and The Masked Destroyer grappled to a no-fall draw with Hahn Lee. Hahn Lee applies chin lock on the Destroyer. In the first championship match, Sweet Daddy Siki and Maddog Mayne won two our of three falls from the team of Jimmy Snuka and Sam Steamboat to retain their Hawaiian tag team titles. Sam Steamboat with a leg lock on Maddog Mayne. Sweet Daddy Siki has a choke hold on Steamboat while Snuka stretches for the tag. Sam Steamboat comes to Snuka's aid in the corner as Siki prepares to strike. The night's other championship match featured a women's World Tag Team title match. Champions Susan Green and Sandy Parker put their titles on the line against former champions Donna Christianello and Toni Rose. Green and Parker won the titles from Christianello and Rose three days earlier on November 24th at the Honolulu International Center. Sandy Parker and Susan Green approach the ring followed by their fans. After both teams split falls, Rose and Christianello defeated Green and Parker to regain the women's tag team championship. Sandy Parker applies a hammer lock on Toni Rose as Susan Green prepares to do the same with Donna Christianello. Sandy Parker has a body scissors and head lock on Toni Rose. Donna Christianello and Toni Rose celebrate after winning back the World Title.